The auction catalogue is now available online! Catalogue photography by Kevin Hewitt Photography Inc.
Catalogue design by Patrick Lucero. Please complete the 2018 TSO Fine Wine Auction – ONLINE Bidder Registration Form. There is no charge to attend. However, all guests are required to register and we encourage advance registration. View/download the 2018 TSO Fine Wine Auction Catalogue (5.2MB). View/download the 2018 TSO Fine Wine Auction Catalogue Errata. View photos of the 2018 wine lots housed in Iron Gate Private Wine Management’s wine storage facility. To submit an absentee bid or telephone bid request, please complete the 2018 TSO Fine Wine Auction – Absentee Bid Form. The deadline to submit absentee/phone bids is 12:00 pm, Wednesday, November 14, 2018. At the 2018 auction, Stephen Ranger, Vice President, Waddingtons.ca, one of Canada’s leading auctioneers, will invite wine lovers to bid on an extraordinary array of some of the finest wines from around the world. 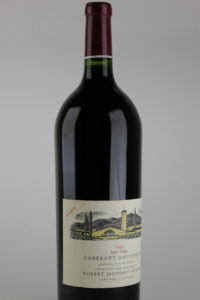 Rare fine wine offerings are from many of the great producers, including special vintages and oversized bottles. 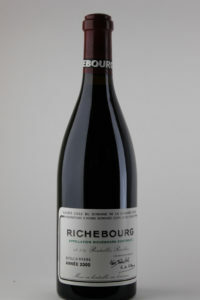 Wine buyers pay only the hammer price. There are no additional taxes (HST) or buyer’s premium because we are formally recognized as a charity auction. Buyers are supporting the Toronto Symphony Orchestra (TSO), one of Canada’s major cultural organizations. Proceeds from the wine auction benefit the TSO and its school and community programs, and tuition-free enrollment for all members of the Toronto Symphony Youth Orchestra. Since inter-provincial shipping of wine is now sanctioned by Bill C-311, oenophiles outside Ontario will be able to phone in bids on our splendid offerings. Check your provincial restrictions for further details. Donations are now closed for the 2018 auction. 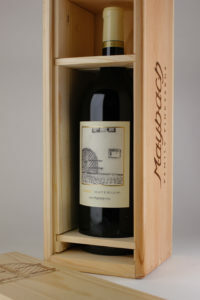 We are now accepting donations of fine wine for the 2019 auction. Since its inception 28 years ago, this annual fundraiser has raised over $7M with the generous support of donors and buyers! Funds raised support the world-class Toronto Symphony Orchestra (TSO), and provide funding and support to the Toronto Symphony Youth Orchestra and its tuition-free enrollment, and the TSO’s music education programs that reach thousands of students each year. As a donor you can do your part in our community by donating a bottle or selection of fine wines from your cellar to the Toronto Symphony Orchestra Fine Wine Charity Auction. Donations of fine wine are accepted year-round. 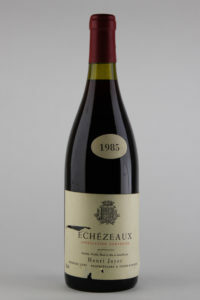 However, wine for the 2019 auction must be received by July 31, 2019 for inclusion in the 2019 catalogue. To be eligible for a 2019 charitable income tax receipt, donations must be received by December 31, 2019. Donations to the Auction are eligible for a charitable income tax receipt based on the appraised value of the wine in accordance with Canada Revenue Agency guidelines. For more information, please contact Linda McGeown, TSVC General Manager at lmcgeown@tso.ca. Your donation supports the Toronto Symphony Orchestra (TSO) and its school and community programs, as well as the TSO’s tuition-free enrollment for all Toronto Symphony Youth Orchestra members. Donations provide critical support for the TSO’s educational programming and help enrich our community. 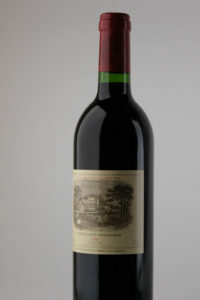 Your donation is appraised by our professional appraiser (Robert Jull of Vinifera Wine Services), and picked up by our Fine Wine Auction Committee at no charge to you. All donated wines are stored at our wine storage facility (Iron Gate Private Wine Management). If you contribute wine valued at more than $2,500 you will receive a voucher from the TSO for two complimentary tickets to a TSO concert. All donors receive an invitation to an exclusive TSO rehearsal as long as scheduling permits. Past rehearsals have included world-renowned guest artists such as Yo-Yo Ma, Lang Lang, and Itzhak Perlman. 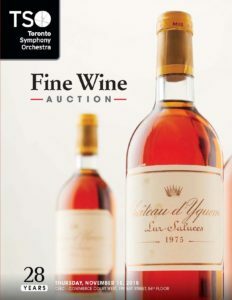 As a donor, if you wish, you will be recognized in the TSO Fine Wine Auction catalogue. All donors will receive a complimentary copy. You will receive a tax receipt based on the appraised value of your wine donation. Tax receipts are issued in accordance with Canada Revenue Agency (CRA) guidelines. A Look Back at Our 2015 Auction!